When long-term performance characteristics of plastics materials is compared, Polybutene-1 offers the total package for piping systems. Whether it is compared for flexibility, resistance to chemicals, creep, pressure and CLTE stress (Cyclic Linear Thermal Expansion); acoustic capabilities, product weight or toughness, Polybutene-1 delivers the long-term performance required for today's hot and cold pressurised piping systems. The unique morphology and crystallisation behaviour of PB-1 gives it unrivalled properties for pressurised piping systems. The property combination setting PB-1 apart from competitive materials is its high flexibility combined with outstanding resistance to internal pressure creep resistance over a wide range of temperatures. All polyolefinic materials tend to creep when exposed to continuous stress over a long periods of time. This cold flow behaviour can be suppressed by creating a 3-D network in the polymer structure such as the physical and chemical linking utilised in the manufacture of Polyethylene (PE-X). Polybutene-1 however, displays superior inherent creep resistance (see table below) without the need to apply any additional cross linking, copolymerisation or compounding modification. In its simplest homopolymer form, the property profile of Polybutene-1 makes it the ideal choice for satisfying the demands of hot and cold pressure piping systems applications. Parallel standards to ISO 12230 exist which present the effect of time and temperature on the expected strength of the materials listed below. The data presented in these standards provides a useful means of comparison of the performance of these alternative plastic materials used for piping systems. After 10 years of exposure to continuously applied stress, the best performing Polybutene-1 (PB-H & PB-R) retains over 50% more strength than the medium performing materials (PE-X, PP-RCT & PE-RT type II) and 70% - 90% more strength than the lower performing materials PE-RT type I and PP-R.
After 10 years of continuously applied stress, PB-1 retains over 50% more strength than PE-X, PP-RCT and PE-RT type II, and 70-90% more strength than PE-RT type I and PP-R.
By employing standardised dimensional criteria presented in ISO 10508 it is possible to calculate the maximum allowable hoop stress of these alternative polyolefin pipes for the various standardised applicational temperature classes. 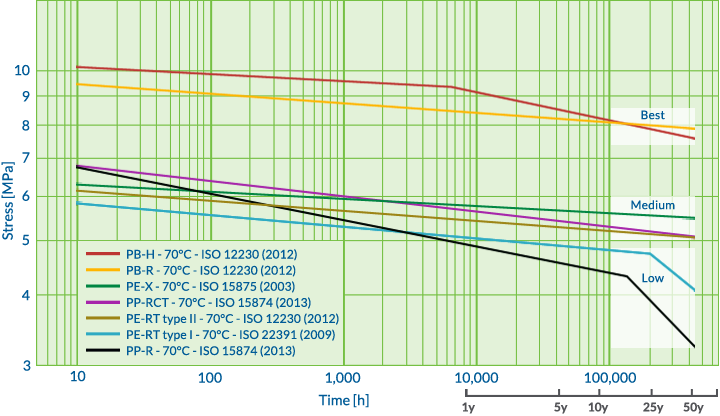 This calculation of design stress results in the comparison presented in the table below which shows that PB-1 polymers achieve the highest hoop stress values across all standardised application classes. The intrinsic stress bearing advantage of PB-1 is between 35% and 90% higher, depending on application class and material. This effectively means that at equivalent thickness, PB-1 pipes offer a significant safety factor over these alternative plastic materials for installed systems. From the maximum allowable hoop stress, we can calculate a minimum allowable wall thickness. It is clear from the calculation that Polybutene-1 pipes can be produced with a significantly reduced wall thickness when compared to other materials dependent on applicational standards limitations. Lower wall thickness also means a larger internal bore for a given external pipe diameter resulting in reduced head pressure loss and lower flow speeds to deliver a fixed volume of water. In contrast to other thermoplastics used in piping applications, performance modification via compounding, cross-linking or copolymerisation is not necessary for PB-1 piping systems to fulfil the stringent performance standards applied to their use. In comparison with other polyolefin materials, Polybutene-1 has a higher level of resistance to strain under continually applied stress over long periods of time. This is known as creep behaviour and the graph illustrates the superior performance of PB-1 at times in excess of 100 hours. In addition to its excellent mechanical and thermal properties, PB-1 provides a high level of resistance to chemical attack and also offers a level of flammability resistance meeting the demands of most applications. PB-1 can be processed via standard injection moulding or extrusion processes into a broad range of products. In its most simple homopolymer form, the balance of properties of PB-1 make it the technically preferred material for the production of pressurised hot and cold water piping systems. Calculated for application class 2, 10 bar design pressure, based on published data. The thinner pipe walls, high elasticity and low specific density in PB-1 pipes leads to high absorption of operating noises. Among the superior properties of Polybutene-1 in comparison with other materials its excellent sound dampening. The combination of thinner pipe wall construction, low elastic modulus and low specific density in Polybutene-1 pipes (ρ = 0.9 g/cm3) leads to high absorption of “water hammer” and other noises associated with heating and cooling in pipe systems. Tests showed a 90% reduction of pipe-borne noise in the Royal Albert Hall in London after the installation of PB-1 pipes. A column of moving water within a pipeline contains stored kinetic energy arising from its mass and velocity. Since water is essentially incompressible, this energy cannot be absorbed when a valve is suddenly closed. The result is a high instantaneous pressure surge normally referred to as 'Water Hammer'. With people living together in greater density the noise levels and acoustic properties of piping systems are a significant issue. Piping systems that minimise fluid noise and water hammer where pipework passes through ceilings and walls are a key element in addressing residents’ noise concerns. Repetitive water hammer can be destructive to pipe systems. 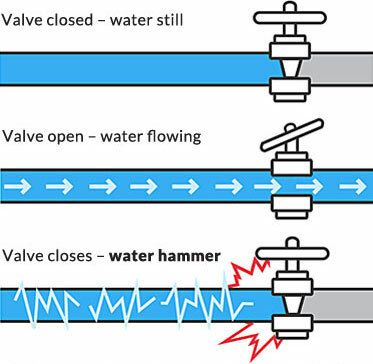 Beside the noise, water hammer can cause pipelines to break if the pressure is high enough. The low elastic modulus of Polybutene-1, combined with reduced wall thickness gives rise to a low surge pressure for a given pipe OD and pressure rating. The table below compares maximum surge pressure for 38.1 mm (1-1/2") OD pipes of different plastic materials, designed for the same pressure service. When compared to PP-H, PP-B, PE-RT and PEX, PB-1 has the highest SDR Class and delivers the best acoustic capabilities including the lowest level of water hammer. A true cost comparison between piping systems should include installation time, jointing options, life span and SDR rating. For building projects, the true cost variation of piping systems across competing materials is more than a per length cost comparison for the same outside pipe diameter. Specifiers look at: ease of installation impacting onsite costs; jointing options, long-term system performance and projected life span; and Standard Dimension Ratio (SDR) comparing pipe materials for durability against pressure. When compared to PE-RT and PEX systems, PB-1 offers significant benefits across a broad range of performance categories all contributing to make PB-1 piping systems the optimum choice for high performance piping installations. 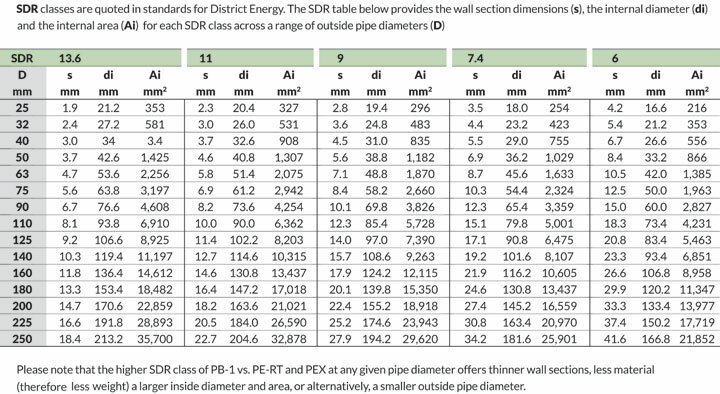 SDR rates pipe durability against pressure and correlates a pipe's outside diameter and wall thickness. The SDR or the Standard Dimension Ratio refers to the geometry of a pipe. SDR is a method of rating a pipe's durability against pressure and it describes the correlation between the pipe dimension and the thickness of the pipe wall. 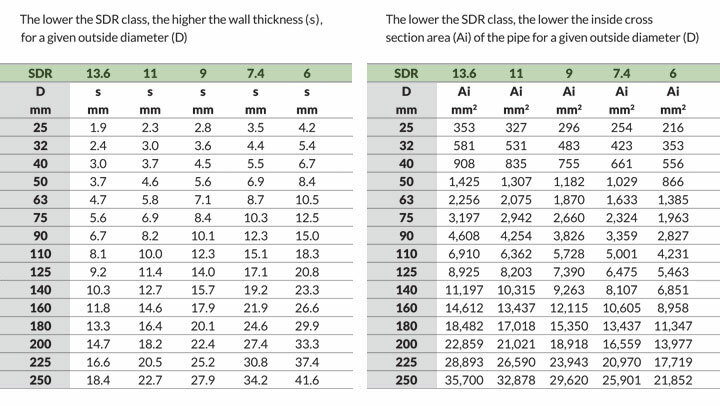 SDR 11, for example means that the outside diameter of the pipe is eleven times the thickness of the wall. Why does SDR matter for piping systems? 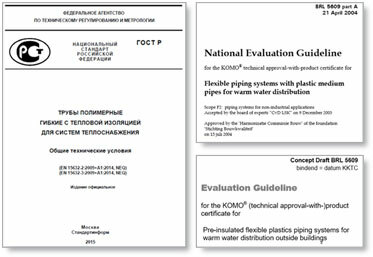 The current Russian standard for District Heating (GOST 56730 – 2015) and the Dutch guideline (BRL 5609 - and the draft of renewed BRL 5609) both include a comparison of 3 materials for District Heating piping systems: PB-1, PE-RT and PEX. Both the Russian standard and the Dutch guideline have the same requirements in relation to the pipe dimensions and SDR classes of the 3 service pipe materials operating at pressures of 6 bar, 8 bar and 10 bar. Per the Russian standard and the Dutch guideline the table (at right) is an excerpt of the relevant table showing the SDR classes for the listed materials at different pressure ratings. As indicated, for each operating pressure PB-1 is listed in the highest SDR class when compared to either PE-RT and PEX. 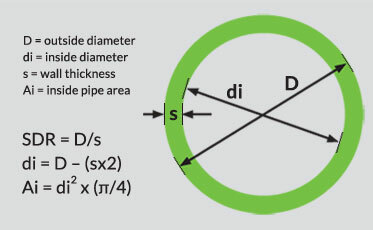 The section below explains what this means, why standards refer to pipe dimensions and SDR classes and what are the benefits for pipe system specifiers. To illustrate the performance of PB-1, PE-RT and PEX in relation to the given operating pressure of 8 bar at the small pipe diameter of 50mm ø, the table and diagram below provide a comparison of the internal pipe dimensions required. Per above, at the same water pressure, the larger inside diameter of PB-1 50mm outside ø pipe delivers a substantially higher flow rate than the other two materials. Taken the other way, at a given flow rate PB-1 pipes yield a lower pressure loss requiring less energy to run systems and/or pumps with a lower capacity. As shown in the graphs above and for the purposes of comparison, PE-RT may be considered the benchmark at 100%. When comparing the inside cross-section area of a 50mm ø pipe (left graph) PB-1 clearly outperforms PE-RT with an additional 27% of volume. 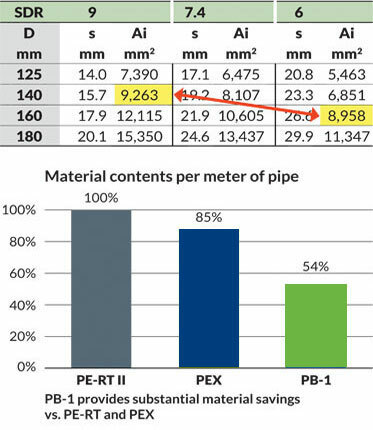 Also, in comparing the amount of material per meter for a 50mm ø pipe rated for 8 bar (right graph), PB-1 pipe uses 29% less material than PE-RT. Once again for the purposes of comparison, PE-RT may be considered the benchmark at 100%. Per the above graph (left), using the same operating water pressure, a 50mm outside diameter pipe (8 bar) made from PB-1 delivers a substantially higher flow rate of +35% when compared to the identically rated PE-RT pipe of the same outside diameter. Measured using the other comparison point (right): at a given flow rate (output) PB-1 pipes yield a 44% lower pressure loss versus PE-RT pipes. This means that PB-1 pipes require less energy to run a system - or - can accommodate pumps with a lower capacity for the same output. Due to a higher SDR rating (and therefore a thinner wall section) a PB-1 pipe of 140mm ø delivers the same performance as a PE-RT pipe of 160mm ø, but with a smaller outside diameter and larger inside pipe cross-section area. 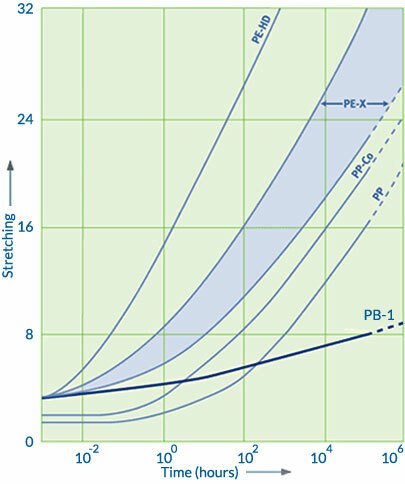 In addition, as shown in the graph (right), the weight of 160mm outside diameter PB-1 pipe rated for 10 bar is almost half of the weight for the same outside diameter and rating pipe made from PE-RT. Key Learning Objectives | What does a higher SDR class mean in practice? 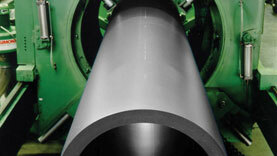 – What are the benefits of using PB-1 in pipe systems against alternative thermoplastic materials? Webinar: What does a higher SDR class mean in practice? Polybutene is often referred to as Polybutene-1, Polybutylene, PB-1 or PB. Polybutene is not sold by PBPSA members for use in pipe applications intended for use in North America, and those parties require their customers or distributors not to sell products made from Polybutene into pipe applications for North America.